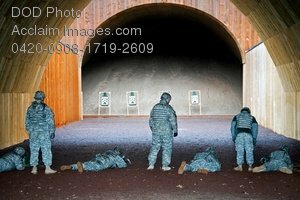 Description: Free, public domain image: U.S. Army Soldiers During Weapons Qualification. U.S. Army Soldiers, from the 554th Military Police (MP) Company, fire M16 weapons, during weapons qualification, at the range complex, in Stuttgart, Germany, Jan 23, 2008. The 554th MP are preparing for deployment. (U.S. Army photo by Martin Greeson.